Here’s a video that gives a pretty good example of a comprehensive medical kit designed for a group. It comes from Analytical Survival on YouTube, which is a channel chock full of smart things to do in a grid-down world. We highly recommend spending some time there to broaden your knowledge on a wide range of skills (H/T DanMorgan76). Training trumps gear every time (please repeat this ten times out loud). A wise shooting instructor once told his pupils, “every bullet that leaves your gun has a lawyer attached to it.” That holds true for cool-guy medical gear. Whether or not you have the training, every advanced procedure you do has a lawyer attached to it. If you are not trained in that procedure or not operating under the proper medical control, there will be a team of lawyers attached to it, and they will prang you into oblivion if it goes wrong. I know that we are all about grid-down on this site, but always keep this in mind as you stock your supplies and kit. The Good Samaritan Law gets pretty gray pretty fast on advanced procedures being performed without online medical control. Analytical Survival’s “about” page hints at a history of experience with his kit, so I’m not too worried about him doing something silly. The mission will always drive the gear. What he developed feels a lot less about being in a war and a lot more about providing a broad range of medical care in primitive / remote conditions. If you plan on being around lots of explosions, shrapnel, and bullets, then your medical kit is going to be very different than if you are going to fight Ebola in West Africa, or be the neighborhood boo-boo fixer. As we move along here at Hogwarts, we’ll work to get some recommendations of what to stock in medical kits in different environments and for different roles, including estimated costs for items based on published prices. We are highlighting this one as an example of solid, broad-based thinking, but not saying everyone needs to go out and stock this kit. You can feel the cost blasting through the roof as he goes through his kit item by item. A good kit is going to set you back, but if you take a long view of it, you’ll get there eventually. Your gun safe didn’t fill up overnight, and neither will your medical kit. It’s all about priorities. 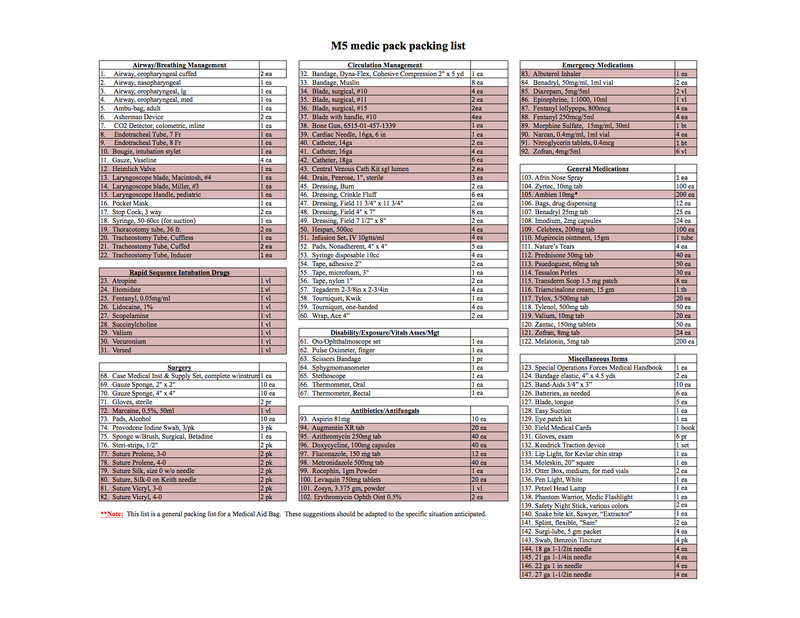 Below is a printable form of an M5 medic pack packing list downloaded from a US Army web site. It is similar to the packing list found on pages 33-35 (1-18 through 1-20) in the SOF Medical Handbook. You’ll see that it is a more general medical kit than trauma kit. What we have highlighted in integumentary pink are items that are considered advanced. Everything in white is stuff you can get without having to jump through bureaucratic hoops. Print it out and see what you have, don’t have, and also identify what you do have that’s not on the list. That can be a start for prioritizing acquisitions for your own kit. Also ask yourself, “What do I know how to do?” If the answer is “Apply a band-aid and an ice pack” then get the gear that enables you to do that. If you are a CRNA, then stocking (legally, of course) all the supplies for field anesthesia might be something you can do. Don’t get things you don’t know how to use thinking you can just learn them on the fly. That’s a great way to hurt somebody. Start basic, and stay basic until you know how to do more. Do No Harm. Right? We recommend the first method, since a femoral artery bleed can kill you in minutes. Good luck! Here’s the MS Excel file of the list. Fantastic idea starting this blog. This is a resource I am in serious need of..
training in a particular specialty. Emergency or Trauma medicine is a specialty all by itself. Bottom line if you are preparing for grid-down medical issues. Recruit a knowledgeable medical resource for your group, then, get them to put together a bag like this. I would add a bit of wisdom from a chap I once met, who had a medical kit that was FAR beyond his minuscule medical training. He knew his limits, but also wanted to have everything around in case someone else in his group had the training, and could use something he brought to advantage. He was also filthy stinking rich –even by doctor standards– so our typical logistical limits simply did not apply to him. I very much endorse the idea of recruiting someone into the tribe that has as much medical training as possible, and as specific as possible. I am a pulmonary/critical care physician–but would be happy to take a TCCC course from any one of a number of instructors, and would most certainly not show up with an ego. I’d learn a ton, too. I would ditch the saline irrigation fluids as EM research shows no advantage in wound irrigation with sterile NSS vs tap water in trauma. Also would not waste time or weight with hydrogen peroxide. Use of peroxide in wounds is not a positive in healing, actually is harmful despite the gratifying bubbling…..
Could you toss in a link to the papers? I’d like to read them. Hope this isn’t too tangential to the topic at hand, but I stock plenty of H2O2, and here’s why. Even if it is overrated for wounds, I’ve found that it puts the kibosh on toothaches like nobody’s business. Apply directly to the affected tooth with a medicine dropper. For more regular use, if you can’t get your hands on toothpaste, I’ve found peroxide to a very effective substitute in combination with baking soda and, if available, peppermint oil. Now a few caveats before you go dumping a highly reactive oxidizing agent in your mouth. 1) If you have metal fillings, just stop reading now and forget that you ever saw any of this. Oxidizing mercury inside your mouth is a bad idea. Probably a bad idea if you have any other metal dental work as well, such as bridges, braces, etc. Think rapid corrosion of anything involving metal. 2) Make sure to keep your head leaned forward so it doesn’t dribble down your throat. 3) If you have any lying around, popping a vitamin C (and/or a few gulps of some sort of citrus or cranberry juice) before oral use of peroxide is also worthwhile. If any peroxide does get into your stomach, the vitamin C, being an antioxidant and all, seems to do a fine job of preventing it from reacting with the stomach acid and causing one to belch chlorine gas (ask me how I know, blechhh). 4) For some, the standard 3% solution is a bit harsh on the gums, so feel free to start with a dilute solution and work your way up as you see fit. 5) While the toothpaste substitute does a fantastic job of disinfecting your teefs, it’s an acquired taste, by which I mean it tastes like scorched-earth warfare. Also, if using a medicine dropper for direct application, disassemble, empty and rinse the dropper when you’re done, as the peroxide will attack the soft rubber bulb. Even it doesn’t touch the rubber directly, just the high concentration of O2 generated by the hydrogen peroxide’s decomposition will cause the bulb to fall apart in short order. One more thing — do NOT substitute baking powder for baking soda as a toothpaste substitute. While it should be fine in theory, every commercial baking powder formulation I’ve seen has included some sort of starch in the ingredients. As luck would have it, our saliva contains a digestive enzyme amylase, which breaks starches down into sugar right there in one’s mouth, in practice making baking powder worse than useless as a dentifrice. Please folks NEVER put peroxide in an open wound. All that bubbly stuff Dr. Jeff mentions, its oxygen being pulled out of healthy tissue. What does you wounded tissue need in order to heal… you get a gold star for knowing and your wound heals quickly….Oxygen ! Dave, I think you MIGHT want to go back and see how H202 does what it does since you have this way wrong. The bubbling is from the peroxide lysing organic material (eg destroying it) by burning it (that IS what oxydation is). It most certainly is NOT O2 being pulled from healthy tissue. Now, having said that, H202 is ok for the FIRST wash of a wound but NOT for any later washes since it will destroy what clotting and healing may have taken place since the earlier wash.
Bluemudpatriot, yes H202 is an oxidation agent and it is effective in killing wound pathogens. You may as well pour sulfuric acid ,another great oxidizer, into the wound. H202 is also very effective in doing the same thing to healthy tissue. So you want to kill all the surrounding healthy tissue in a wound by dosing it with H202 and then close it up to create a nice little 5 star bacteria hotel ? The redox reaction that occurs with microbes and healthy cells, IS the release of 02 when they are exposed to H202. When the cells release their oxygen and combine with serosanguinous fluid, you get BUBBLING. When the good cells and bad cells are robbed of their oxygen, you get dead cells. Dead cells whether they were good cells or bad cells before, now become little petri dishes inside the wound to grow some great MRSA. What it only attacks the foreign bodies ? You MAY want to revisit some medical scientific studies on using H202 in wound treatment.. There are also some nice explanations that describe the electron exchanges in oxidation and how it affects cellular structure in basic chemistry class.